Everything you love about a classic pressure cooker low country boil is now done in half an hour! Simply fill the Multipot with shrimp, sausage, corn, and potatoes, then spice it up with seafood seasoning. Serve this dish at small, casual parties for a fun new experience with your guests. The quick cooking time and easy clean-up make it the perfect no-fuss recipe. Let this be a great addition to your summer or spring food spread! Do you love eating spicy dishes? 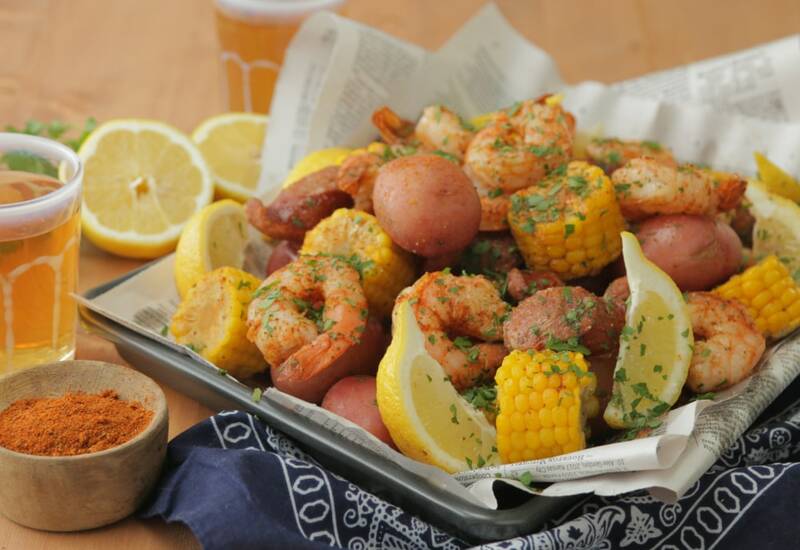 Don't forget to add a dash of cajun spice to your pressure cooker low country boil to give it a zesty flavor! Pressure cooker shrimp is one of our favorite dishes to make in the pressure cooker, super quick and all the restaurant flavor without the big bill. Per Serving: 895 calories; 60g fat; 47.4g carbohydrates; 38g protein; 253mg cholesterol; 3267mg sodium. Full disclosure: it's crawfish season, so instead of shrimp, we used this recipe to do crawfish, keeping everything else exactly the same. Even used an Abita Turbo Dog for the beer to keep it feeling a bit Louisiana bayou. In the spirit of a crawfish boil, shared the rest of the sixer with guests. Was delicious. Those potatoes! I made this low country shrimp boil for a football party and it was so good. I love new potatoes, and they came out so tender! Next time I'll probably add crab as well! This recipe was enough for me and my husband (and we ate a lot!). I've only ever made low country boil with seafood seasoning, so I enjoyed this version with Cajun spices and beer. Super easy to make and the potatoes didn't fall apart. So good! I used frozen corn and andouille sausage for this boil. I also used extra Cajun seasoning because I like mine extra spicy. Simple, straightforward and easy to make without lacking flavor! The beer was also a nice touch! I made this dish and man was it delicious! I’m making it today for Valentine’s Day because my husband really enjoyed it! Made it with andouille, shrimp, corn and potatoes and it was great. Covered it with lemon and some olive oil at the end and a bit of salt.